At least 10 people have been killed in a suicide bomb attack on a bus in west Jerusalem, along with the bomber. 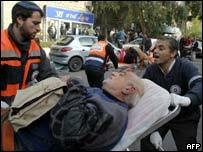 Dozens were also injured in the blast which was detonated not far from Prime Minister Ariel Sharon's residence. Mr Sharon was not there at the time, but in an early response he cancelled a meeting with donor countries that had been meant to ease conditions for the Palestinians. The blast coincided with a complicated prisoner swap between Israel and Lebanese militant group Hezbollah, including hundreds of Palestinian militants. Al-Aqsa Martyrs Brigades, a militia loosely tied to Palestinian leader Yasser Arafat's Fatah movement, claimed responsibility in calls to news organisations. However, Israeli officials said the bombing would have no bearing on the prisoner exchange. The bomber was named as Ali Munir Ja'ara a policeman from the Aida refugee camp near the West Bank town of Bethlehem. On Wednesday Islamic Jihad had promised to avenge an Israeli incursion in the Gaza Strip on Wednesday in which eight people including five of its fighters died. Mr Sharon's spokesman, Raanan Gissin, said the attack illustrated why Israel was building a controversial barrier in the West Bank. Palestinian Authority officials condemned the bombing. "This vicious cycle can only be broken by renewal of a meaningful peace process," said Palestinian negotiator Saeb Erekat. "Otherwise, violence will breed violence, bullets will breed bullets." In Washington, the US administration said it condemned the bombing "in the strongest possible terms". The explosion happened just before 0900 (0700 GMT) in the Rehavia district, about 100 metres from the prime minister's official residence. A spokesman said the body of the suicide bomber was so badly disfigured it has so far been impossible to say whether it was a man or a woman. But the Associated Press news agency quoted Palestinian officials as saying that the bomber was a member of the Palestinian police force in Bethlehem. Israeli radio said the bus was packed with staff from a nearby hospital ending their night shift. The BBC's James Reynolds in Jerusalem says there are debris and body parts half covered with plastic sheeting all over the road. Some body parts were thrown into nearby houses, according to police spokesman Gil Kleiman. Witnesses said the explosion tore apart the bus, shattering windows. "I saw sights that we are now becoming used to seeing: a bus with its back part cut off, people jumping from the bus," said one eyewitness, who gave his name as Ofer. Stephane Ben Shushan, a local shopkeeper, said the bus was moving slowly in heavy traffic when the explosion went off. "It's a real nightmare, you can smell the blood," he said. The attack comes a day after eight Palestinians were killed in clashes during an Israeli army raid on the Gaza Strip - the deadliest incursion for weeks. The latest Israeli incursion followed an alert about a possible attack on the nearby Netzarim settlement, the Israeli military said. A spokesman said soldiers were met by Palestinian anti-tank missiles, mortar fire and other explosive devices. Palestinians said four civilians not engaged in military activities were among the dead and many others were wounded, including an ambulance driver. The militant Islamic Jihad group vowed it would avenge the incursion, saying at least five of its fighters were among the dead. The last suicide attack in Israel took place on 25 December near Tel Aviv, killing four people. "This strike followed a familiar pattern"